Agonists acting at the mu-opioid receptor (MOP-R) have two important functions related to motivational systems: (i) to suppress pain and (ii) to promote reward seeking. Their most important clinical application is for pain relief. In fact, MOP-R agonists are the most powerful analgesic agents currently available. The unparalleled therapeutic efficacy of MOP-R agonists undoubtedly results from the fact that they have several pain-inhibitory actions. They directly inhibit pain transmitting neurons in the periphery and central nervous system. They also act on descending pain modulatory circuits that control spinal cord pain transmission. In addition, MOP-R agonists produce powerful positive motivational effects. These effects are mediated by a circuit that includes dopaminergic neurons in the midbrain ventral tegmental area and their connections to limbic forebrain regions including sub-cortical areas such as the nucleus accumbens and amygdala. Because MOP-R agonists produce robust positive reinforcement, their repeated use can lead to addiction, which limits their use as analgesics. 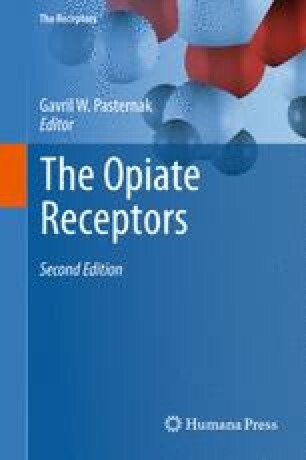 In this chapter, I will outline the actions of MOP-R agonists on the neural systems that transmit and modulate pain and at the central nervous system sites that underlie analgesia and reward.